While a Springer makes you enjoy biking, it also gives your dog a good exercise. It has been used with ease by over 600,000 bicyclists who love dogs all over the world. However, the Springer, which is an excellent dog exerciser, brings along health benefits to you as you jog side by side with your dog. Here is a customer review of this dog exerciser. To read more reviews and check out more images of the Springer Bicycle Jogger Click Here!. Or continue to read our review here: With a Springer, you do not need any practice to operate it, or install. This is because you can mount or dismount it in 2 seconds without using any tools. For the initial installation, you only require a 13 mm wrench. After the installation, however, the bracket mount will always stay on the seat, but the other parts of the device can be installed easily and quickly when the device is not in use. Moreover, the Springer is very comfortable to ride because your hands are always on the handle bar, hence helping you maintain your stability. In addition, it reduces the tugs of your dog by about 90%. This dog exerciser fits mountain bikes, touring bikes, and regular bikes which are made with normal triangular shapes. This helps keep your dog firm in place, and protected from wheels, pedals, ad traffic. Its coil spring, which is lowly mounted, absorbs and decreases the pulls and the sudden jerks of the dog, which helps you maintain your balance. Moreover, the Springer has a patented safety release which frees the dog in case it runs on the other side of an obstacle such as pole, a tree, or a hydrant. There are other impressive safety features that a Springer possesses. For example, the design of this dog exerciser allows for three unique fastening positions for the cord to Springer arm. These positions depend majorly on the strength of your dog, and your weight as the rider to make the exerciser operate at its best. For instance, a small adult or a child exercising with a small dog will require the lowest setting of the fastening positions, while a full-sized and strong adult exercising with a heavy dog will require a different setting. Generally, the cost of a Springer is between $110 and $140, depending majorly on the supplier as well as the shipping or taxes involved. 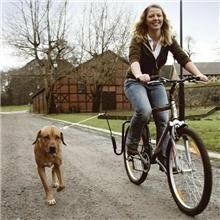 However, if you like riding bike and you love your dog, this dog exerciser will give you more opportunities to enjoy being active together. If you’re looking for a less expensive alternative, check out the WalkyDog Dog Bicycle Exerciser Review. Find the Springer Bicycle Jogger.